NOW, together we begin, just as we are. NOW we are ready. No need to wait until we are more centered, or stronger or happier. We are supported right NOW to move together into a deeper understanding of our Center, our Strength, our Joy. Life is a journey. Whether we cultivate deep roots to stand firm, strategically maneuver in orchestrated campaigns, or carelessly cavort on the whim of impulse, forces greater than our paltry schemes compel us to drift with the current. We can try to hold on, or at least steer, or float along fully aware of not only the futility of other options, but steadily anticipating the multitude of blessings which will infuse us if we welcome them along with the hardships we cannot control. When you live life in this way you develop a sense of where you are being taken before you arrive. I have had that feeling many times in my life. I knew I’d take thousands upon thousands of photos the first time a camera was literally dropped into my lap at eighteen at a wedding, even though I didn’t take another picture or buy a camera for another seven years. I knew I’d be an engineer in the seventh grade, the first time I heard there was such a thing, even though I didn’t know what it was. I knew I’d take years and years of jump shots the first time a basketball was placed in my hands as a toddler, even though I was too small to conceive of how strong I’d need to be to throw it that high. I knew from so far back I can’t recall I’d eventually practice yoga. I was delivered to RB Yoga in late 2014. After seeing the marquee for the umpteenth time, it spoke to me. I had recently retired from full time employment, partially because my job for the last twenty years involved torturously long plane rides and sitting for hours in meetings, which had left me with poor circulation in my calves and pre-arthritic hips. A trip to help one of my daughters move into an apartment revealed how stiff my shoulders were. After two days of Ikea furniture assembling, I couldn’t lift my arms above them! Add my feet, which are completely flat and were never flexible even when I was young, and three bicycle rides a week to help knot every muscle from the waist down, and I saw someone in supreme need of yoga. So, when I started taking a beginner’s class with Lori Cota, the purpose was to increase my flexibility. I thought so little of yoga as a workout, I would ride my bike before class, to make sure I wasn’t losing fitness substituting one for the other. That lasted a couple of months, until I realized yoga was the perfect companion to biking, both were moving meditations which synergized each other. And what led to that conclusion was Lori was not as concerned about the quality of the stretching I was doing as the quality of the breathing I was doing. Yoga, after the first few sessions, was revealed to be the attainment of controlled, relaxed breathing more than flexibility, and the greatest gains in flexibility would come only after the breathing was deepened, mastered, glorified. Poses were learned, balance was explored, muscles were toned, but all was meaningless without the breath. The awareness of the breath, where it goes on the inhale, what it does as it dissolves into the lungs, what it releases from the body and mind on the exhale. It is the breath that cleanses, the breath that strengthens, the breath that informs. After practicing more than a year in her class, Lori suggested I take Jeanne Stone’s Wednesday morning All Levels class. My body still felt like a beginner’s, but at least I had reached the point where I knew what I was trying to do, even if I still couldn’t do it. As with the beginner’s class, I felt the atmosphere was welcoming and my class mates were helpful, and after a few sessions yoga began to mean something else to me entirely. It was no longer about better breathing or greater flexibility, those were just the side effects. The purpose of yoga is to help foster compassion. Compassion for myself and the fragile shell in which I am housed; compassion for my fellow travelers, as all of us are suffering from the same limitations that comprise being human; compassion for all things in the universe, living or dead or yet to live. The compassion to share. Compassion as defined by sympathy, empathy, concern, kindness, consideration, care, and benevolence. Compassion is the antidote to suffering and lights the way to true joyfulness. A compassionate person is more flexible. A compassionate person remembers to breathe. A compassionate person can rejoice in their successes and laugh at their failures equally, aware both are blessings to be experienced and not obstacles to be avoided. It does not matter if I can stand on my head, or on one leg with my arms stretched out, or do the splits like a cheerleader. I can try and fail, try and succeed, or not try at all; with compassion. I can be strong when I fall and accept my rewards with humility. I can use the gift of yoga to help keep me buoyant as the current churns. I do not plan to stop attending a beginner’s class, no matter how skilled I become in yoga. I will always consider myself an initiate, needing the instruction given to a novice, and needing the humility only a novice can harness, to propel me along the path I have not set for myself, but the one which will lead me to my best future self. It is not a competition. No one who has ever been born or will ever be born can be on this course and fare better or worse. It is my journey and mine alone, and I am grateful for any compassion I acquire along the way. Thank you, RB Yoga, all the teachers and students, for helping to provide it. On the occasion of RB Yoga’s 10th anniversary, I just want to thank you for all that the studio means to me. I have been active all my life, but, when I turned 45, tired of the loud music in the gym and of getting sweaty and out of breath, I started looking for a different kind of physical activity. That is why I decided to give yoga a try. From the very first day that I set foot in your studio, I felt at home. I have never been very flexible, and, very soon, I started to notice the physical benefits of the practice. But what really surprised me was how yoga was also affecting all the other aspects of my life. When I practice regularly, I become more focused and mindful in all my endeavors. Yoga centers me in the present. Like so many of us, I have a very hectic and busy life, but the moment I cross the door of the studio, I can feel that I have arrived to a safe haven, where I can reconnect with myself. All the teachers are wonderful, and, under their guidance, I have learned so much about my body and my mind, and also to feel more connected to those around me. I have developed more confidence, but also more humility. I have been coming to RB Yoga for over three years now, and I know I will continue to practice for the rest of my life. Thank you from the bottom of my heart, and my best wishes for many more years of happiness and success. My yoga journey began three years ago when a colleague invited me to attend an introductory class taught at our office gym. I agreed perfunctorily, expecting that I’d feel silly doing it, then make my excuses, and never go back again. My first class was a revelation. A decade of sitting at a computer every day had left me overweight and out of shape. Yet, the practice struck some latent chord and I woke up the next morning with a sensation of bliss. From that moment, I was “hooked” and I began practicing with the ferocious zeal typical of a new convert. In that first brush, I treated yoga solely as a set of physical challenges and as I pushed myself to master one pose after another, my creaking body struck back. Within the first two months, shooting and debilitating pain engulfed my back. Recognizing the need for adult supervision, I found my way to RBYoga. 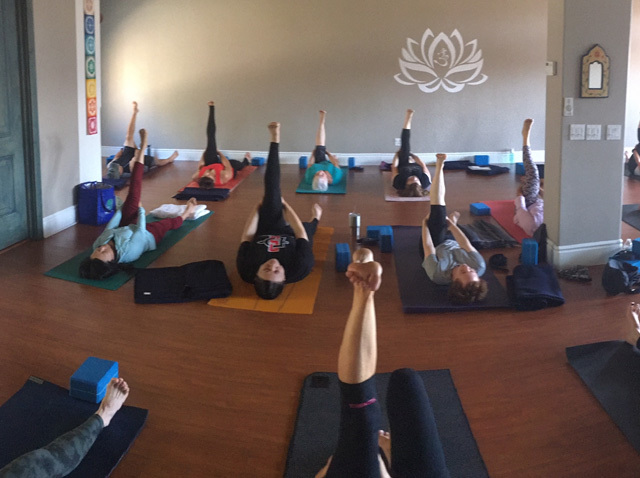 For the last three years, guided by the skill, experience, and compassion of my teachers at this studio, I have found a nurturing environment that supports a safe, healthy, vigorous, sustainable asana practice. The benefits of a regular practice have been amazing. Not only have I felt increasingly healthier and stronger, I lost 40 lbs within the first six months of embarking on this journey. Thanks to the patience and knowledge of my teachers, I now have a more sophisticated sense of the subtleties of breath, mind, and body. They have provided me with the strength, balance, discipline, and courage to explore the boundaries of physical practice. They have taught me that the four corners of my yoga mat serve not just to release physical energy but also for contemplation, meditation, reflection, introspection, and as a relief valve for emotional stress. My teachers are but one pillar of the RBYoga community; my fellow students on this path are the other. Their support and friendship helps sustain my practice and makes it so much fun to come to the studio each day and I am proud and happy that they choose to share their journey with me. My Yoga practice began when I was in junior high in 1973 and over the past 37 years I have practiced a variety of Yoga styles. My life has been filled with happiness. Through 27 years of a fulfilling marriage, to teaching my students as an Elementary school teacher, to believing I can make my dogs laugh (ha! ), I know what healing power lifting your spirits has. I have been blessed my entire life: surrounded with love and laughter. Practicing yoga with the dear people at RB Yoga is a wonderful experience with each class I attend. Whether it’s learning a new pose, overcoming a challenge, applying what we learn on the mat to every day life, or encouraging one another to reach a new peak, I leave there happy and rejuvenated. I continue to be amazed that after 37 years of practice, that nearly every class I attend I continue to learn something new. I appreciate the different levels offered and the expertise and love we as students receive from the instructors. In my early thirties I had a pretty regular Ashtanga practice. About a year and a half into my practice I began to experience numbness in my hands, feet and arms immediately following class so I reluctantly gave it up. About five years later I was diagnosed with Multiple Sclerosis. Early into my diagnosis I decided to take a positive and proactive approach to slowing the progression of the disease. Virtually every book and article I read recommended yoga so I decided to give it another try. I was nervous about causing a relapse so I chose Hatha Level 1 with Jeanne at RB Yoga. About halfway through my first class I started to cry – not because I was feeling sad or sorry for myself, but because I realized how much I missed yoga and how happy I was to be practicing again. In addition, here was a beautiful studio with an obviously compassionate and highly skilled teacher about two minutes from my house! That was nine months ago, and now I take 4-5 classes a week at all different levels. My intention for yoga is very different now than when I was first practicing. Before MS, yoga was all about getting the best workout I could and so I pushed myself into poses I probably wasn’t ready for. When I wasn’t able to master a pose I often felt frustrated with myself. When sitting on curled toes, I used to fidget and count the seconds until it was over. These days on curled toes I catch myself with a smile on my face because I’m so happy to feel my feet. And tree pose? Forget it! Every time I do it my heart overflows with gratitude for balance, even though my tree can be pretty wobbly at times. Because I have no way of knowing the course my MS will take, I view every class and every pose as a gift. I am grateful that MS led me to my practice at RB Yoga, where every teacher is talented and knowledgeable, and in any given class you can see long time practitioners who inspire with their grace and strength, as well as people brand new to yoga. I first came to the practice of yoga a few years ago looking for physical exercise. I had been a dedicated runner and a long-time gymnast until my knee worsened to the point where I was unable to continue doing high-impact sports. However, within the first few classes I became increasingly aware of the mental and spiritual benefits this practice had to offer, in addition to the physical benefits. Soon I found myself coming twice a week, then three times and some weeks even five or six. I found that my body literally yearned for yoga, which compelled me to practice more and more often, both at home and in the studio. The practice of yoga continues to support me in my daily life, both on and off the mat. As a dedicated activist for animals, the environment and peace, I am bound to come in contact with some difficult people. This practice has helped me to better understand how to deal with my frustrations and how to let go of things that are no longer serving me. As the San Diego Organizer for the Student Peace Alliance (a non-profit organization campaigning to establish a cabinet-level U.S. Department of Peace) I dedicate a large amount of my time to the campaign. While I am fortunate enough to meet many wonderful people through my work, I am also constantly dealing with skepticism, cynicism, intolerance, and ignorance. It is unlikely I would be able to continue my work without a dedicated practice. The principles of yoga have given me a sense of spiritual guidance and an outlet for life’s difficulties. While I have so much gratitude for the practice of yoga as a whole, the additions of a teacher like Jeanne and the atmosphere of the RB Yoga Studio have made a world of difference. All of the teachers I have had the honor to practice with have had something new and inspiring to offer. Additionally, the warmth of such a tight-knit community adds so much to my practice. It is a blessing to be able to practice with so many wonderful people every week. This practice has brought so much to my life in so many different ways. It constantly reminds me of all that is good in the world and truly makes me want to be a better person. It is a gift that I will be able to keep with me all my life. Making the decision to become a Yoga teacher and share this sacred practice with others is never so heart fulfilling as watching students like Jan & Joe in their practice. For the past 15 months, Jan & Joe have been committed to their Yoga practice and watching them grow and deepen is truly an honor. They come together to the same class, same time, week after week, month after month, rarely missing a session. Watching these two amazing souls interacting with each other, helping and supporting one another is an opportunity for us all to move deeper into our hearts. Here is Jan & Joe’s personal story…. Joe and I have been married for over 31 years. We have been coming to RB Yoga for over a year. The idea of practicing yoga really appealed to us because it was something we could do together – yet work at our own pace in class. We were first introduced to yoga at a local high school adult education class. We liked the stretching and enjoyed learning the various poses, but the school room atmosphere was not all that pleasant. As the year went by, Joe was diagnosed with the onset of Parkinson’s disease and yoga was highly recommended to help him stay limber. We decided to give yoga a try again. 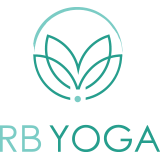 We chose RB Yoga because we drive by every day going to and from work and wondered how a professional studio would be for our practice. It’s now been over a year since the two of us started attending RB Yoga each week and we are “Sunday regulars.” In the beginning, the awareness of our breathing and the concentration involved in holding the poses was such a break from our normal daily routine. We both look forward to our practice and how it makes us feel. Our adult children and friends have come to learn not to expect us to be available during “yoga time”. Joe can now hold poses that he could never obtain a year ago. I like how the concentration of the various positions has gotten me to slow down and focus on the present. We had no idea at that time how practicing yoga would enhance our lives but it surely has. I find myself practicing the slow breathing techniques when in heavy traffic or waiting in a long line. We both listen to more soft relaxing music now, especially just before class to get into the “zone”. The concentration and emphasis on the various poses keeps us both limber. We even participated in Jeanne’s “Couples Class” a fun and challenging experience in practicing yoga poses as a couple. Hope she offers that class again! On a personal note, I like that no special equipment is needed to practice yoga – we simply carry in our personal yoga mats- RB Yoga supplies the straps, the blocks and the blankets. 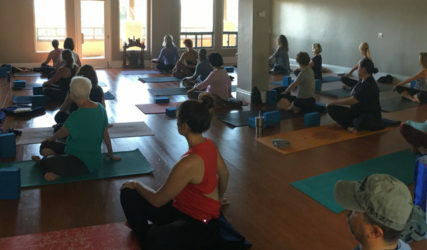 We like how the atmosphere is non-threatening and the community at RB Yoga is friendly. Jeanne or her “supersub”, Sarah, always assures that we align our body correctly when in a pose. This was the best investment that we’ve made in ourselves. RB Yoga time is “our” time. 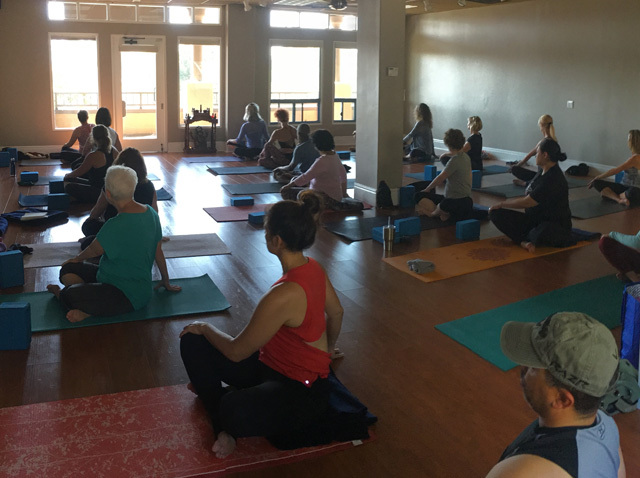 Patanjali’s authoritative Yoga Sutras begins with an invitation: “Atha Yoga-Anusanam – Now we begin the study of Yoga.” This auspicious invitation is a call to come together in the heart of our community (kula) for us to begin our practice. While we all endeavor to cultivate a practice at home, we have all experienced the joy and the power of practicing within a group of like-minded individuals. It is my honor to introduce Meg – an amazing bright light shining in our Yoga community. Meg started her Yoga practice over two years ago and she instinctively heard the call to practice from her heart and with her heart. 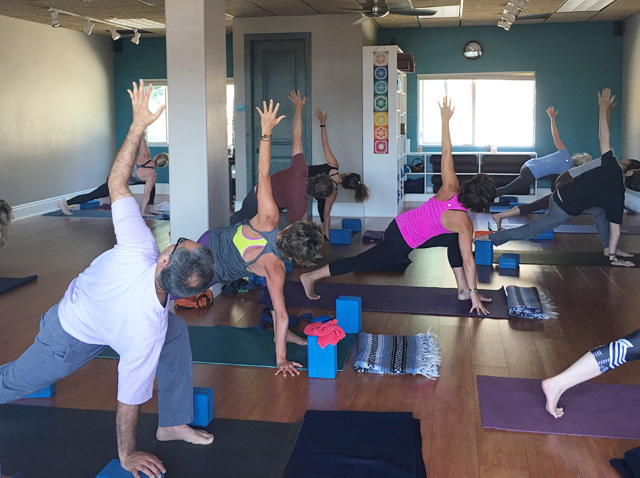 So much in fact that she came to the studio with her very own kula – Meg and seven of her coworkers all came to class every week to move and breathe and celebrate their hearts together. Meg’s kula is shining brightly and has grown to include every person she meets in class. Meg continues to be committed to her practice -always willing to dive deeper into the many aspects this vast practice has to offer. It is a pleasure to introduce Meg to you and have her share her Yogic journey. Several of my colleagues were looking for a lunch hour activity where all of us could participate and get a work out. We are a varied group of women in our 20’s, 30’s, and 40’s and for a couple of us, 50’s. Our fitness levels and interests were just as diverse. One of my co-workers suggested that we try yoga since it would give all of us an opportunity to participate as well as provide a great physical workout that could help us reduce workday stress. In the beginning, we participated in a series of classes at another location, and when Rancho Bernardo Yoga opened, we moved our practice. 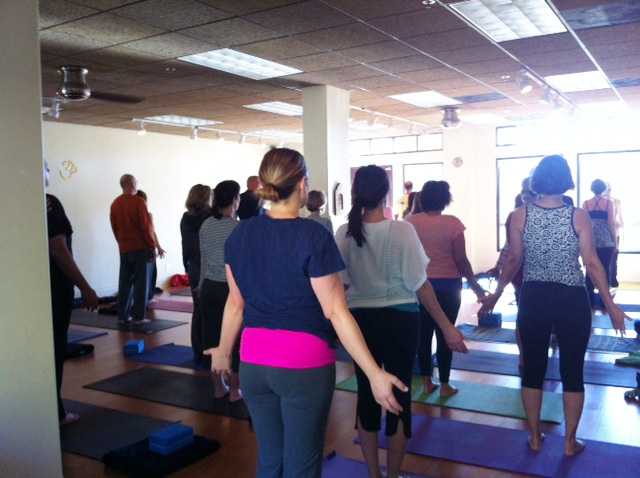 After we began practicing at RB Yoga, we found that yoga was much more than a lunchtime workout. The group accountability really helped us to make the commitment to leave work even in mid-project to attend class. Although many of us had never participated in yoga, we found ourselves looking forward to the weekly sessions and when we returned to the office we would talk about the class and the difference it was making in our lives. We began to leave the pressures of work behind us during the sessions, and when we returned to work we had a calmness and focus that wasn’t present before going. During my first few months as a yoga novice, much of what occurred in class was a complete mystery. The names of poses, understanding the translation of some of the Sanskrit words, sun salutations, and balance poses were all very different from any exercise class or activity I had attended. Since I’m not flexible, it was also very challenging not to feel intimidated in class when others seemed to effortlessly move into poses that I could only hope to achieve. After a few months at RB Yoga, I found that yoga was increasing my flexibility as well as my strength. I also began to realize that yoga was much more than a physical workout and I wanted to increase my knowledge and understanding of my practice with a mix of group and private sessions. The private sessions increased my understanding of the subtle nuances and structure of many poses and also helped me to realize that yoga extended beyond the physical. Combining the experiences of the group classes with the private sessions gave me the opportunity to integrate the mental, emotional and spiritual planes to the physical aspects of the practice. I began to realize that I have a long way to go to understand all the benefits that a regular yoga practice can provide. During class, I found myself working to not compare my abilities to others. I wished for a “Gumby” body and experienced some frustration when I couldn’t achieve certain poses. Accepting and applying Jeanne’s advice to honor our bodies and be grateful that we can participate in yoga was one of the first steps in my journey. I’ve found that yoga challenges me on many levels and it has not been unusual to find that a class could open a door to a new series of questions. Rancho Bernardo Yoga has been a wonderful experience for my co-workers and myself. 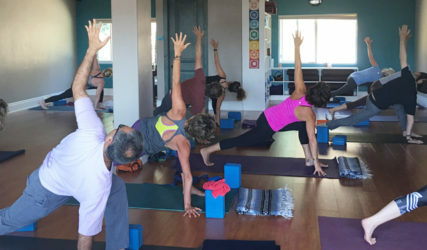 Jeanne and all of the instructors have been more than willing to offer suggestions to adapt the yoga practice to our various levels of fitness, flexibility, injuries and body types, regardless of our age. Jeanne and her instructors never compromise our bodies for the sake of “practice”. Injuries, past or present, are treated with gentleness and honor. The instructors always teach modifications to every pose to help prevent re-injury. Lastly, an unexpected benefit of practicing at RB Yoga has been meeting fellow yoga practitioners. We’ve found a wonderfully accepting community of individuals who participate regularly and offer encouragement and friendship. 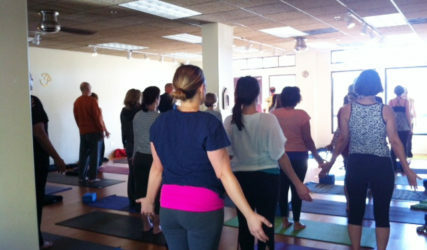 We’re a very diverse group and all of us have benefited from our practice and look forward to attending class regularly. We look forward to broadening our understanding and practice of yoga in the months ahead. I started practicing Yoga regularly in 2003. I had been teaching cardio-kickboxing classes for a few years and loved it, but knew I needed to round out my fitness routine with something that promoted flexibility. Not being very disciplined about stretching, I thought a yoga class would be helpful. It turned out that yoga was more than I expected, deceptively challenging and I got really hooked on it. It was surprising to find out how unlimber I had become over the years, yet in just a few months, I noticed my range of motion had increased and my muscles felt longer. The result was most noticeable when I was hiking, something I do a couple times a week or more. I had less tightness in my lower back and felt more agile and stronger while climbing. I also think that yoga has helped me maintain good posture. While I haven’t nearly achieved complete peace of mind, the practice of deep and rhythmic breathing and moving with breath is something that I recall more often in daily life. I tend to hold my breath when I get anxious or really focused, and so I sometimes even do ‘breath of fire’ to calm myself, or just more quickly remind myself to breathe. 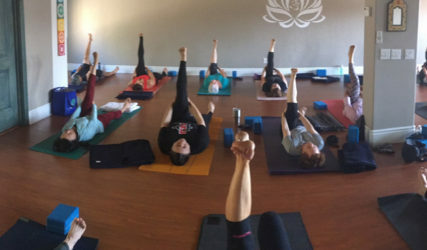 I came to RB Yoga to find an expanded schedule of classes, taught by authentic yoga practitioners in an environment that was dedicated to yoga (rather than going to the gym where all the machines are rumbling outside the yoga class…). I like the range of practice levels offered, and the teachers are wonderful, and the schedule provides lots of options for a busy life. The location really ideal for me, and I’m always glad to find what I need in my own community of Rancho Bernardo. After my father’s death I had a great deal of difficulty accepting his loss. The deep sorrow I experienced manifested in my physical body as different illnesses and multiple doctor visits. The underlying cause of all my physical symptoms was ultimately emotional distress and because I wasn’t interested in taking medications I instead decided to keep looking for other ways to heal. One day at the gym I tried a Yoga class and that was the beginning of my Yogic Journey. After each class I felt much better physically and emotionally. I started connecting with my father in a non-physical way which opened another chapter in my life, one of learning about Spirit. Yoga has become an essential part of my life and I wanted to deepen my practice and take it to the next level. So I kept trying different yoga classes in search of a teacher who offered a spiritual component to the practice verses just a physical workout, which I found with Jeanne. Jeanne gives personal attention to everyone creating a nurturing environment while offering a spiritual practice within the physical. Six years ago I was invited to a yoga class taught by my cousin, he was so wonderfully peaceful and gentle and encouraging. I was really looking for that in my life at the time and so my yoga practice began! I have had the privilege of practicing with some incredible teachers along the way. Like so many, I quickly started to notice my physical strength and flexibility increasing and thought “Wow! How did I do that?” Pretty soon I was on to the next headstand or handstand with no fear. I felt confident in my teacher to guide me to a place I never imagined I could go. I was invited to RB Yoga for the 1st Equinox Sun Salute Celebration by my friend I have admired for years, Darcy. I loved being around her and wanted to find out more about the source of her light. I had no idea what I was in for! The Sun Salute practice with Jeanne was absolutely life changing. Jeanne’s encouragement, support and love for her students really resonated with me. Since that day over a year ago, I am devoted to my yoga practice 6 days a week and it is truly an essential part of my life. I have been blessed with many wonderful people in my life and I am so grateful to all of them. My practice has been my sacred time to learn about myself and grow in understanding, knowledge and awareness. I truly feel connected to everyone in the amazing RB Yoga community. I feel blessed to be part of it. All the teachers are unique and bring their own passion of Yoga to their classes. Jeff and I started our Yogic journey at RB Yoga together. We love doing outdoor activities like hiking and camping, so I was hoping yoga would give us another way to spend time together while doing something healthy for our bodies. I’d gone to various yoga classes over the years, but never found a class I wanted to attend consistently. After spending a couple weeks in bed with a back injury in late 2007, I knew I needed to do something to take care of my body and mind. After our first class at RB Yoga, Jeff and I knew we’d be coming back. On a physical level, it was very challenging, but not unattainable. For me, getting through class with such a sense of confidence was a small win…and that good feeling kept me coming back. For over a year now, Jeff and I have been going to class together at least once every week. We have received so many gifts through yoga. Physically, mentally and spiritually I feel stronger and more full of love, life…light. And I feel so lucky to be able to share this journey with Jeff.